Money Talks — Or Does It? With an exorbitant amount of money in the midterm elections, will voters follow the paper trail? Even when it’s not a major election year, the never-ending stream of political ads make it feel otherwise. And this midterm election has been no different. In fact, this midterm election has seen record breaking numbers in terms of political spending, with The Center for Responsive Politics projecting that more than $5.2 billion will have been spent come November 6th, the largest increase in at least two decades — so expect to be bombarded with political ads, fliers, emails and texts until the very last vote is counted. The numbers have been prolific on both sides, too. This midterm election, however, the donations reaping in from women, small donors and super PACs have created the unprecedented offset in campaign money. This midterm election does differ in the sense that there are more open seats up for grabs and also new challengers to incumbents, yet the increase in spending doesn’t align with previous projecting. According to Sarah Bynar, a researcher at The Center for Responsive Politics, spending should have only increased by about $500, but in reality, the 2018 elections will cost around $1.5 billion more than the 2014 midterm elections. “We’ve seen a lot of activity, but it doesn’t mean that the other [elections] aren’t just as important.” Deanna Spikula, Registrar of voters, stated. Although both sides are fundraising at high levels, the Democratic fundraising has seen the starkest differences when compared to prior elections, as well as compared to the opposing party’s efforts. According to The Center for Responsive Politics, Democrat House candidates have raised more than $951 million, compared to the Republicans $637 million. They have also outnumbered their Republican opponents in the Senate race, with democrats raising $513 million, compared to $361 million. With this major increase in spending, understanding where this pool of money is coming from is extremely important. Traditionally, money comes from political fundraising by candidates, small private donations and super PACs funded by the wealthy. In this midterm election, there has been a huge influx of women donors, who historically donate much less compared to men, which is speculated to be fueled by the election of Donald Trump and the uptick in women running for office. According to OpenSecrets.org, women have donated $308 million to Democrat candidates, and $90 million to the Republican party. Although the numbers from female donors are big in retrospect, the majority of campaign funding comes from billionaires that contribute to PACs and super PACs, for example the Democratic Congressional Campaign Committee, Senate Majority Fund, Congressional Leadership Fund. Due to a handful of court cases in the last two decades, the legalities of who discretely donates has caused many ebbs and flows of secret billionaire campaigning over the years. In a 2010 supreme court decision, SpeechNow V FEC, it was mandated that these super PACs could donate unlimited sums of money for or against a candidate, as long as they weren’t giving money to a specific campaign or candidate directly. This election cycle, the largest donation to super PACs is Nevada’s own billionaire, Sheldon Adelson, donating a total of $112 million to the Republican Party. The next biggest donors are Tom Steyer of San Francisco, contributing $51 to the Democrats, and Michael Bloomberg of New York, also donating $38 to the Democrats. This course of funneling money from a non-profit to a political campaign, known as Dark Money, was unsurprisingly down in this elections campaign funding. Although it is mandatory for super PACs to disclose any contribution of over $200, it is not legally binding that 501(c)3 non-profits disclose their donors to the public. Big donors use this system to indirectly and anonymously donate to the political super PAC of their choice, because although the super PAC must disclose where the money came from, the nonprofit organizations are not obligated to do the same. Estimates show that about $128 million has been spent using this tactic this election, which is down from previous elections. It is speculated that this is due to a recently overturned ruling that previously protected dark money groups from disclosing their donors. With this excess in political spending, it’s no exaggeration that voters have seen a serious increase in political advertising. According to the Wesleyan Media Project, Democrat House races have aired about 40,000 ads that are funded by dark money, and 90,000 dark money ads in the Senate races. These ads have also had a huge increase of negative or attacking tone, which is up 61% compared to the 2014 midterms. 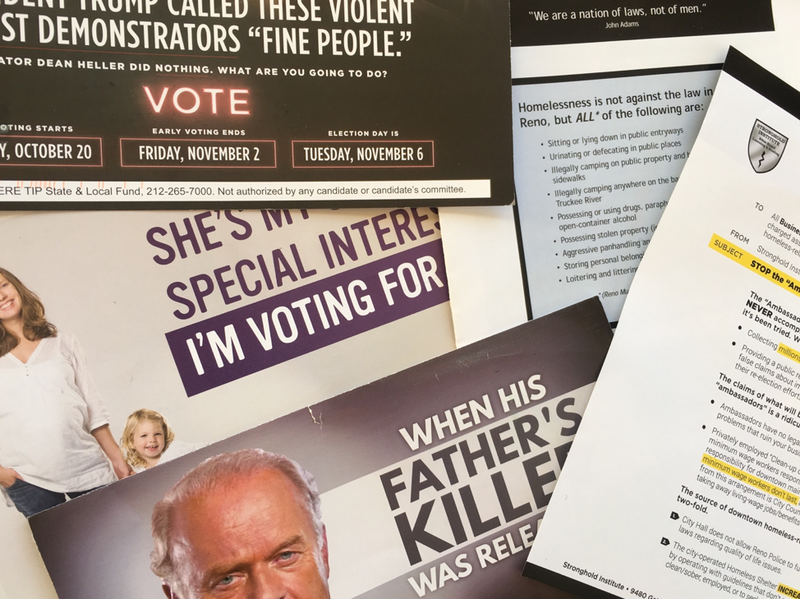 Voters have also seen a surplus of issue ads, which are known to be attacking towards a candidate, but aren’t backed by any particular political group. As explained by Erica Franklin Fowler, of Wesleyan University, who explains that voters are sick of the polarizing, negativity in politics. With all the money spent, are the endless political ads having any impact on voters? The overall consensus seems to be that the ads are annoying, aggressive, and pointless. Abby Lupoli, a baker at Great Basin Co-Op who is planning to vote come Tuesday, stated that the ads haven’t changed her mind at all, and pities the influence it potentially has on other voters. “The ads are negative, don’t say much besides blatant claims about how wrong the other side is, and then doesn’t even tell you who to vote for. What’s the point in that?” Lupoli stated. Others had a similar view, agreeing that the amount of polarization was even discouraging to the overall efforts of voting.